Your dorm room decorations are a pretty important part of your dorm room. Your dorm bedding will add style and comfort to your dorm room, but your other dorm room decorations like your wall decorations for dorms will also add plenty of comfort to your college dorm room. You'll notice the difference between your plain dorm room walls and your dorm walls with some dorm decorating done to them. Your college wall decor is probably going to be the last dorm essentials you put up in your college dorm room. Once you put up even just one college poster, you're going to instantly the notice the difference it makes to your dorm room decor. Your dorm room will feel more like home and your dorm room walls will look so much better - trust us, they're pretty plain to start with. One of the best dorm wall art items to add to your dorm room decor is a college poster with a scenic view such as our Bay Bridge San Francisco College Poster! Our Bay Bridge San Francisco Dorm Poster is absolutely breathtaking college poster. 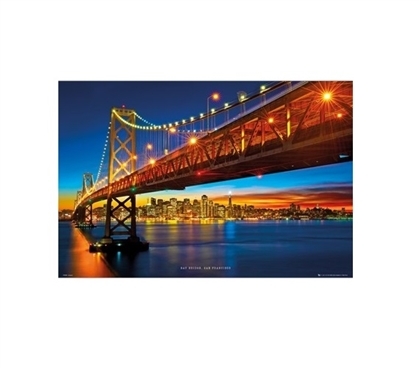 This dorm essentials item features the Bay Bridge with San Francisco in the backdrop. This is already a stunning view, but this view is made even more beautiful by the lights, sky, and water. The sky has so many gorgeous colors in it, it's almost hard to believe! The sky in this college supplies item features navy blue blending into aqua which then blends into yellow, orange, and a burgundy color. The water in this dorm necessities product reflects some of these colors and in other areas it is a deep, gorgeous blue. You can't go wrong with this stunningly gorgeous scenic view of Bay Bridge in your dorm necessities!